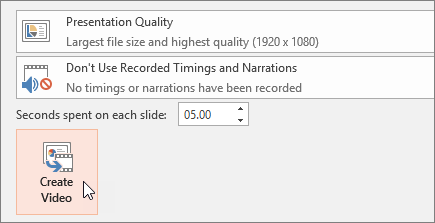 In PowerPoint, you can add animated GIFs, videos from your computer or online videos, recordings, export your presentation as a video, and even add captions to videos. Select the animated GIF you want to add. Select Slide Show to see the animated GIF play. Online Video: Add a video from YouTube or paste in an embed code. Video on my PC: Add a video that's stored on your computer. Select Insert > Screen Recording. Select the area you want to record. Note: Captions can't be added to online videos. For more information, see Create closed captions for a video. Select the video you want to add captions to. Select Video Tools > Playback > Insert Captions. Select the caption file and select Insert. Select and drag to resize and move your video around. Select Format to put frames and effects on your video. Select Video Effects, Video Border, or Video Shape to add effects, borders, or crop your video to a shape. Select Corrections or Color to adjust the video’s color tone. Select Poster Frame to choose the video’s opening frame, and then click and drag with your mouse to select your preferred frame. Select Poster Frame > Current Frame to confirm your choice.